What's the Table Made Of? Can I Customize It to Suit Me? What Tools Will I Need? The pictured table is made from Pine Boards and has a hardboard top. It has been given a clear natural finish but can also be Painted or Stained any color that suits your taste. 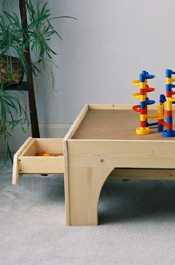 The table has been constructed with optional Built-In Drawers which provide valuable space for storage of train pieces. The table is approximately 32"W x 48"L x 18"H.
This table can be made from any wood product which is available in 1 x 4 , 1 x 6, and 1 x 10 boards. You can upgrade from pine to a nicer wood such as Aspen, Oak, Maple, Walnut or Cherry, or downgrade to MDF. You can make minor adjustments to the dimensions as required. Total cost will depend on the exact materials, hardware and finishes you choose. Sandpaper and Sanding block (a portable hand held vibrating sander is helpful but not necessary). Foam Brush and Clean Cloth for applying finishes. What's Included? Compare Table Designs Order Now!